Mountain View Cemetery is a celebration of stone even if you ignore the knockers scattered about the grounds. Granite and marble are the two traditional rock types used—or I should say, stone types because commercial granite and commercial marble aren’t always what the geologist would call them. Marble and granite combine at this lovely grave, translucent marble to evoke life and spirit, stern granite to document fact. (Click the photo for a larger version.) It seems a little odd, doctrinally, to depict an angel being sentimental about a human death. But those who mourned this woman of 37 surely wanted to suggest that even a fleshless heavenly being might give a thought to the injustice of her early death. On the other hand, the angel’s face is impassive, and its gaze is not downcast. The book in the angel’s lap says what it says. Maybe the marble is as stern in its way as the granite. This entry was posted on 12 March 2010 at 1:38 pm and is filed under Oakland stone. You can follow any responses to this entry through the RSS 2.0 feed. You can skip to the end and leave a response. Pinging is currently not allowed. I always enjoy traveling through your blog. Both the Crocker and Schmidt angels at Mountain View echo Albrecht Duerer’s Melancholia. Duerer did his work, an engraving just after his mother’s death. I found the other day that Mountain View Cemetery itself uses the Crocker angel on its front page. 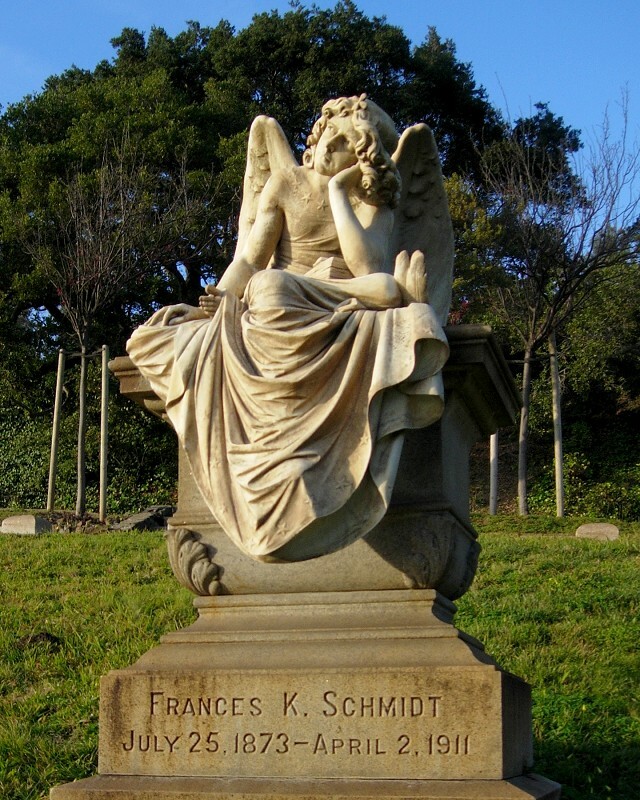 That one is a female angel, and the Schmidt angel is maleprobably just a matter of convention. I prefer the Schmidt angel, because it looks more adult. Angels are not putti! Michael Colbruno has posted a nice assortment of the cemetery’s angels, cherubs and putti on his Mountain View People blog.